Die Cutting Machine Perfect for all your cardmaking, scrapbooking and papercrafting projects. It doesn't take up a lot of space and creates perfect ( and small) die cute every time. The Diamond Press is quick and simple to use too, with no previous experience of die-cutting required. You simply run your thin metal die or embossing folder through the machine to create elegant and beautiful cardstock with nothing more than a little creativity and a simple turn of the handle. 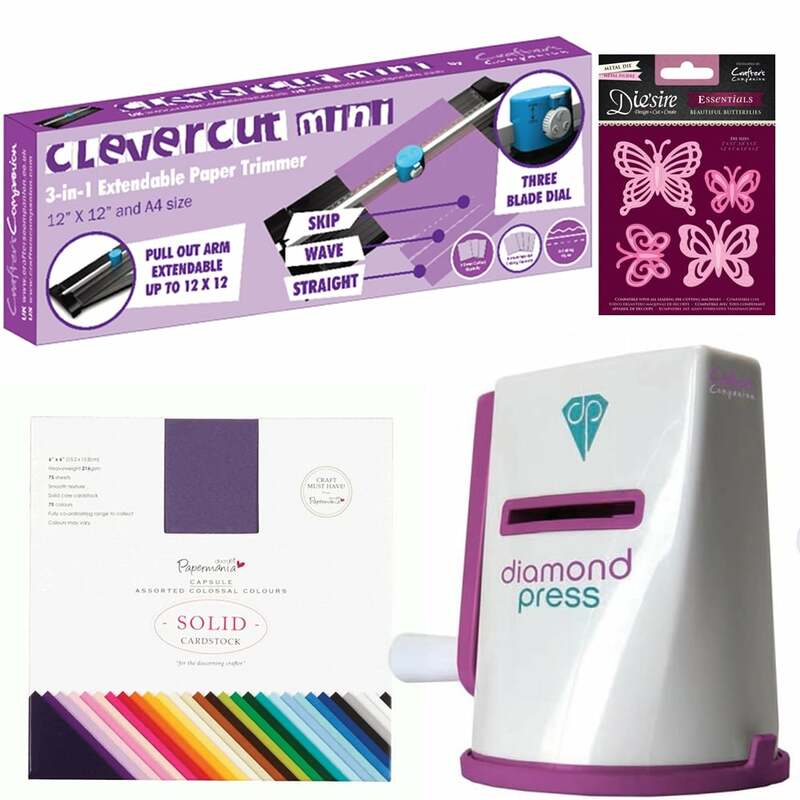 The Diamond Press makes it easier than ever to put a personal, artistic touch on all your DIY projects, taking your inspirational ideas from the imagination to a stunning creation. This Premium Smooth Textured Cardstock pack is from Papermania, one of the worlds leading names in papercraft. It contains 75 sheets of Heavyweight 216gsm smooth textured card. This is perfect and versatile for use in all craft, decorative and papermaking projects. This high quality card is easy to fold and cut and could also be used in a whole host of other creative projects, including collage, presentation and display, design, fine art, paper modelling  its uses limitless. Create beautiful butterflies Dies set of 4, perfect for stamping onto or embellishing to use as toppers. The dies can be used for a variety of projects including cardmaking, scrapbooking and more. Perfect for gift tags and embellishments.